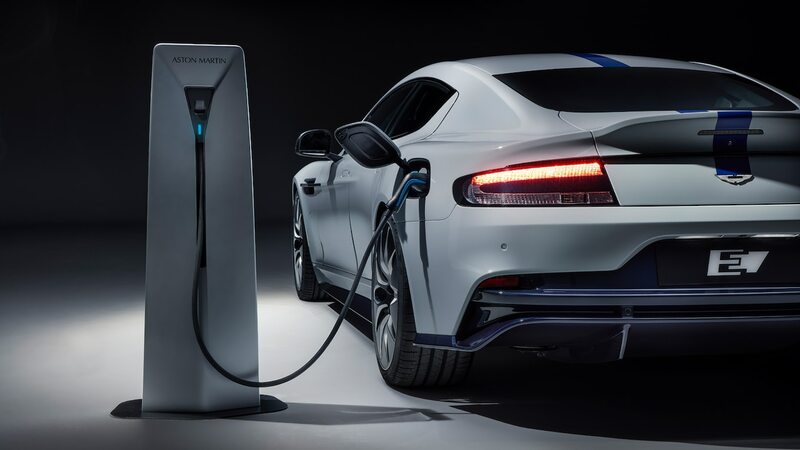 Powered by an 800-volt, 65kWh battery, Aston Martin estimates the Rapide E will be able to travel over 200 miles on a single charge. Twin motors mounted on the rear axle will generate 450kW (or over 600 horsepower) and can get the car up to a top speed of 155 miles per hour. That will happen fairly quickly, too Aston Martin says the Rapide E will go from 0 to 60 miles per hour in under four seconds (which is a tick faster than the standard internal combustion Rapide S). When plugged into a high-speed charger, the car’s battery can be recharged at a rate of 310 miles per hour. On the outside, the Rapide E mostly resembles the combustion engine car it’s based on, save for some electric blue accents in the headlights and on the brake calipers. Under the hood is where things are most different. The battery system has been designed around the space where the combustion version’s V12 engine, gear box, and fuel tank normally go. This means the Rapide E doesn’t have a full floor of batteries like, say, a Tesla. While that cuts down on design and engineering costs, it ultimately limits the number of battery cells (and ultimate capacity) that an automaker can fit in the car. In the end, the Rapide E weighs 4,717 pounds, which is about 400 pounds more than the internal combustion Rapide S.
The Rapide E was announced in 2015, right around when Aston Martin was going through a big cost-cutting push that resulted in hundreds of layoffs. To get the Rapide E (then just called “RapidE”) project off the ground, the British automaker lined up funding from Chinese financiers. Then, in 2016, Aston Martin announced it would build the car with Chinese tech conglomerate LeEco the company founded by Jia Yueting, who also founded (and now runs) struggling EV startup Faraday Future.